Inspired by style, inspired by design, herea the Coquitlam Residences at the Parc. Phase 2 of this masterplanned Coquitlam condominium community is coming soon, so please priority register today for all the updates and news available on the presales. An exciting collection of exlcusive Residences at the Parc Coquitlam real estate development that offers residents a life in perfect balance is coming soon. Poised between the vibrancy of Coquitlam Town Centre and the serenity of the surrounding parks, The Parc Residences in Coquitlam real estate marketplace embraces a modern urban lifestyle full of service and prestige. The Phase 2 release of presale Coquitlam condos at The Residences at the Parc are coming soon and developed by the Executive Group of Companies and marketed by Mahamed Karim RE/MAX All Points Realty. Located on Glen Drive between Guildford Way and Barnet Highway and between Johnson Street and Pinetree Way, the new Residences at the Parc Coquitlam Town Centre condos will be previewing this Spring 2010. The Location of the Pre-Construction Residences at Parc Coquitlam – Impeccable. Central. Exciting. The elegance of prestige living, with the convenience of having it all right outside your door is now here at the pre-construction Coquitlam Residences at Parc Towers. The freedom to choose between epicurean delights or a barbeque with friends is now available. The vivacity of shopping and nightlife right at your doorstep or the serenity of parks in your backyard. The satisfaction of owning your dream Coquitlam home for sale and the luxury of having everything at your fingertips. The Residences at Park Coquitlam condos for sale is conveniently located near Westwood Plateau Golf Course and training academy in addition to Lougheed Highway, Trans Canada Highway, West Coast Express and soon to come the Evergreen SkyTrain line – allowing very easy access into downtown Vancouver, YVR and the US Border. 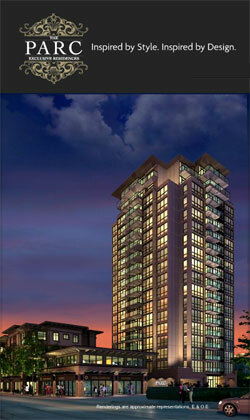 At the Residences at the Parc Tower Coquitlam pre-construction condos, you can have it all! A Great Selection Still Available! If you haven’t had an opportunity to visit the new Coquitlam Residences at the Parc presentation center, we encourage you to do so soon as we still have a great selection of homes remaining. We are now open Saturday and Sunday 12 – 5pm. Prices Starting From Only: $212,900. The RESIDENCES AT THE PARC are exclusive Coquitlam condo resiences that are INSPIRED BY STYLE. INSPIRED BY DESIGN. Residences At The Parc Coquitlam real estate development – City sophistication in suburban comfort. Stylish contemporary 4 story development in the heart of Coquitlam just steps to shopping, entertainment, parks and all conveniences. An exclusive collection of Residences at the Parc Coquitlam condos for sale with special attention to space and style. Choose from 1, 2, and 2 bedroom plus den condos or 2 level town homes. Upscale interior finishings include Bosch Stainless Steel appliances, imported granite counters, contemporary fireplace with wood paneled surround and built-in purifier air treatment system plus great building amenities including a Wellness Centre, Media Room, and private Owners Lounge. The superb Coquitlam real etsate location combined with the fine finishings offered at Residences At The Parc condominiusm has generated an overwhelming interest for this development. Please visit the Presentation Centre to view the great selection of homes still available. We look forward to seeing you soon and introducing you to Residences At The Parc Coquitlam. PRESENTATION CENTRE OPEN: Saturday and Sunday 12-5pm – #202-2959 Glen Drive, Coquitlam, 604 468-7272. GRAND OPENING – April 10th! INSPIRED BY STYLE. INSPIRED BY DESIGN. The developers are pleased to announce that the Grand Opening for Residences At The Parc Coquitlam Phase 2 condos is now set for Saturday April 10th! Selection of Available Homes here at the new Coquitlam Residences at the Parc condos include one bedroom suites from 517 square feet, two bedroom plus den layouts between 813 and 1173 square feet in addition to exclusive Coquitlam Residences at the Parc Townhomes for sale at around 1014 square feet in size. 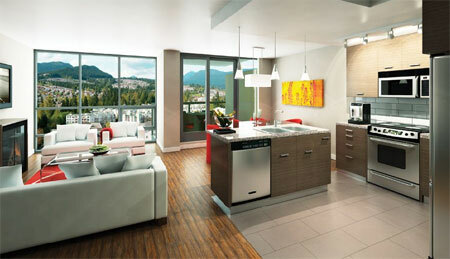 The floorplans for the Residences at the Parc Phase 2 Coquitlam condos are coming soon! City sophistication in suburban comfort. Stylish contemporary 4 story Coquitlam real estate condo development in the heart of the city just steps to shopping, entertainment, parks and all conveniences. Only 30 exclusive Residences at the Parc Coquitlam homes for sale with special attention to space and style. Choose from 1, 2, and 2 bedroom plus den condos or 2 level town homes here a the Residences at the Parc Coquitlam real estate development. These unparalleled condominium homes and townhouses present upscale interior finishings include Bosch Stainless Steel appliances, imported granite counters, contemporary fireplace with wood paneled surround and built-in purifier air treatment system plus much more. The superb location of the new Phase 2 Residences at the Parc Coquitlam condos for sale combined with the fine finishings offered at Residences At The Parc has generated an overwhelming interest for this Coquitlam real estate development. As a Priority Registrant, you will have the opportunity to view the presentation centre prior to the Grand Opening and The Residences At The Parc Phase 2 being released to the general public. We look forward to seeing you soon and introducing you to Residences At The Parc Coquitlam Condos for sale. Thank you, Project Sales and Marketing. PRESENTATION CENTRE WILL OPEN AT NOON SHARP – #202-2959 Glen Drive, Coquitlam. Phase 2 Coming Soon Here at The Residences at The Parc! Release is scheduled for April 2010 and with prices starting from $204,900, the presale Coquitlam Residences at The Parc will be the best real estate value in the city! This four storey Coquitlam condo development at the Residences at the Parc will feature stylish and contemporary apartments in suburban comfort. Close to all the shopping, entertainment, parks and conveniences of Coquitlam Town Centre, the Residences at the Parc Phase 2 condos is a boutique collection of thirty homes for sale with special attention to space and details. There is a great variety of 1, 2 and 2 bedroom plus den Residences at the Parc Coquitlam condo floor plans to choose from in addition to two level townhomes. Upscale interior features include Bosch stainless steel appliances, imported granite counters, contemporary fireplaces with wood paneled surround and built in purifier air treatment system. In addition, there are great building amenities that include the Wellness Centre, Media Room and Private Owners’ Lodge exclusive to the owners at The Residences at the Parc Coquitlam real estate community. Only 30 can have it. Develoepd by the Executive Group of Companies, register today for your sneak peek at the presale Coquitlam Residences at the Parc Phase 2 condos and townhomes for sale. There is no better Coquitlam condo value than at this development with only a select number of boutique condominiums made available in Phase 2. Surrounded by numourous recreational hubs and Coquitlam Town Centre, the Residences at the Parc Coquitlam condos and townhomes will be central to all retail, transportation and dining options. With prices starting in the very low $200’s range, these are very affordable one bedroom Coquitlam condos for sale! The interiors are open concept, sleek and contemporary with cabinetry, flush mount, stainless steel appliances and granite countertops standard in every home. The Residences at the Parc Coquitlam condos also feature built in Purifier air treatment system to filter your air that circulates in your home, leading to healthier living spaces. The Residences at the Parc Coquitlam real estate development is launching sales in April 2010 at 2957 Glen Drive, Coquitlam with the grand opening coming up on April 10th at noon sharp. COQUITLAM RESIDENCES AT THE PARC Coming Soon – March 2010 Update! COMING SOON is Phase 2 of the RESIDENCES AT THE PARC Exclusive Coquitlam Residences for sale! INSPIRED BY STYLE. INSPIRED BY DESIGN. We are pleased to announce that our design team is presently finalizing all details allowing for the final touches to be completed at the pre-construction Coquitlam Residences at the Parc Presentation Centre. In the coming weeks we will be officially announcing our upcoming launch of this exciting new Coquitlam real estate development. Residences At The Parc Coquitlam Condos: City sophistication in suburban comfort. Stylish contemporary 4 story condominium development in the heart of Coquitlam real estate market just steps to shopping, entertainment, parks and all conveniences. Only 30 exclusive pre-construction Coquitlam Residences at the Parc homes with special attention to space and style will be available in the presale phase. Choose from 1, 2, and 2 bedroom plus den pre-construction Coquitlam condos or 2 level Parc Coquitlam town homes. Upscale interior finishings in all of these Residences at the Parc Coquitlam homes will include Bosch Stainless Steel appliances, imported granite counters, contemporary fireplace with wood paneled surround and built-in purifier air treatment system plus much more! The superb and central Coquitlam real estate location combined with the fine finishings offered at Residences At The Parc Coquitlam has generated an overwhelming interest for this property development. As a Priority Registrant, you will have the opportunity to view the presentation centre prior to the Grand Opening and The Residences At The Parc Coquitlam Condos and Town Homes being released to the general public very soon. A Parc Coquitlam Condo sales associate will contact you with any further updates. Thank you, Mahamed, Residences At The Parc Coquitlam, Project Sales and Marketing. As a new release, not much is known about the actual interior finish and features lists just yet. However, as with the original Parc Tower condominiums, the Residences will most likely have similar features and characteristics that made the first phase such a great success. From open floor plans to flexible living spaces and from granite, marble, hardwood flooring and carpeting, the presale Coquitlam Residences at Parc Tower will be like no other. There will be high-end appliance sets, in suite laundry with washer/dryers as well as deep soaker tubs and fireplaces within these luxury Coquitlam condos for sale. Also presented at the presale Coquitlam Residences at Parc Tower is the exclusivity of this boutique collection of low-rise condominiums, much different than the Parc Tower high-rise condos that were released a few years ago. There should be in suite digital music system upgrades in addition to custom work stations in some flexible floorplans. The Parc Residences in the Coquitlam real estate market has been created be renowned designers who have paid special attention to natural and sustainable materials being used in your finishes. Each Residence at Parc tower Coquitlam condos will bring the outdoors in with light and open space. Located in the same vicinity and master-planned development as the Coquitlam Parc Tower, the Residences at the Parc will be coming soon. In the meantime, as we await for more presale condominium information from the Residences at the Parc Coquitlam real estate offerings, let’s take a look back at the Parc Tower that was a successful sell-out upon pre-construction grand opening. The Parc Coquitlam condos for saaaale is an exclusive collection of new homes that offere homebuyers and residents a life of harmonious inspiration. Located between the vibrancy of the bustling Coquitlam Town Centre and the vivacity of the surrounding neighbourhood that is steeped in history and natural beauty, the Parc Coquitlam condos for sale embodies a modern urban lifestyle complete with sophistication and prestige all within an urban condominium living community. Outside, the Coquitlam real estate market area is an urban playground that entices the body and invigorates the sould. Nearby parks to The Parc Tower and to the new Residences at the Parc Coquitlam condominiums for sale offer an oasis of tranquility to sooth the soul. Sidewalks dance with effervescence and serenade to the pulse of the Coquitlam real estate community. Inside, the luxurious design elements and amenities unite to present an upscale atmosphere here at the Coquitlam Parc Tower condos, providing the ultimate in exclusive downtown Coquitlam condo living for homeowners. Together, these elements inspire a living environment unique to The Parc Tower and to the Residences at the Parc in Coquitlam real estate market place. Currently, there are only a few suites remaining here at The Coquitlam Parc Tower condos with prices starting from just $308,000! Unit 202, 302, 703 and 1503 are all one bedroom and den Coquitlam condos for sale and feature between 710 and 879 square feet. The remaining new Parc Tower Coquitlam condos for sale feature unit 1201, 1505, 1603 and 1801 which are all 2 bed and 2 bath floorplans ranging from 885 to 1008 square footage. Outstanding value for new Coquitlam real estate is still available at the recently completed Coquitlam Parc Tower condominiums. The Residences at the Parc is a collection of only 30 urban Coquitlam condominium homes for sale that are conveniently located at 2957 Glen Drive and within walking distance to Coquitlam Town Centre plus a host of other urban amenities and services in this wonderful community. This four storey Coquitlam real estate development features a collection of 1 and 2 bedroom floor plans (some with dens) in addition to two level Coqutlam townhomes for sale with upscale features that include Bosch appliances, built in air purifier, contemporary fireplaces and granite countertops. In addition, homebuyers at the new Coquitlam Residences at the Parc condos and townhomes will have easy access to public transport including the West Coast Express. Close by are top rated Coquitlam schools, entertainment facilities, restaurants and recreational community centres. The Residences at the Parc (phase 2 of The Parc Coquitlam real estate development) is now acceptin pre-registrrations at www.parcliving.com or calling 604.468.PARC (7272).